What a busy week we've had - the children have been enjoying their school holidays (although they are still up at 6am everyday). The first week has gone by incredibly quickly and I can't quite believe it's Friday already. My mum, who has recently relocated to our village, is convinced that time goes faster here than in Wales, and I think she may be onto something. Anyway the good news is that it's Friday AND thanks to my recent knitting frenzy I have a finished object to share with Tami's Amis and Natural Suburbia. Well, it's not blocked yet but it's bound off, and as far as I'm concerned, that qualifies! Unfortunately the pictures taken outside in the bright light don't really show the stitches very well, so these are the best we could do. I was worried it wouldn't fit my *cough* 'curves' so I made the larger size which used less than 3 skeins in total. I bought 4 skeins so still have enough left over for something else. This was a great quick (if I hadn't left it on the table for a few weeks) and very easy knit and would be a perfect first cable project. The yarn is devine and I love the simplicity of the pattern and the finished item. I found it quite difficult to knit on 10mm needles as I prefer 2.5 to 4mm and 4 ply/sock yarn, but I do love the overall effect and variety is always good. A black one would be just perfect for the Winter - I definitely see one in my future. If you missed yesterday's post, Nat from Misadventures in Craft and I have decided on a little knitalong and we asked if anyone else would like to join in. We've had a great response already (here, on twitter and on facebook) including some questions about the pattern and yarn etc. If you're still thinking about whether to join us, here's some more information to help you decide. 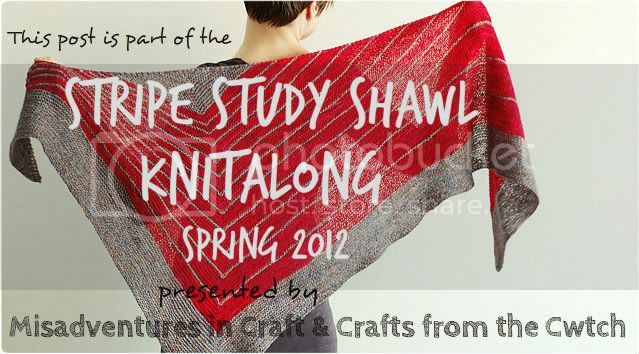 I'm a novice knitter, which skills will I need to knit this shawl? Will I be able to do it? You'll need to be able to cast on, knit garter stitch (knit each row) and bind off. You will need to be able to increase using M1L/M1R (link to videos). The shaping is done using short rows (link to 'wrap & turn' video). If you think you can do these things, then you should be able to knit this shawl without difficulty. Which needles will I need? And what's the gauge? You'll need a circular needle of 80cms or more to hold all the stitches, but will knit it flat. The gauge isn't crucial but the size of the finished shawl will vary if you don't match the stated tension which is: Using 4ply and 4mm needles = 20 sts and 40 rows to 10cm/4" of garter stitch. Which yarn should I use? That is totally up to you. The pattern is written for 4 ply and if you would like inspiration for colours and blends or brands of yarn, I'd suggest taking a look at the Ravelry projects page where over 2,200 Stripe Study Shawls are already pictured. You'll see that you need two colours and a 100g/400m skein of each will be enough if you're using 4ply as per the pattern. I'll be sharing my yarn choice on Tuesday's update post! 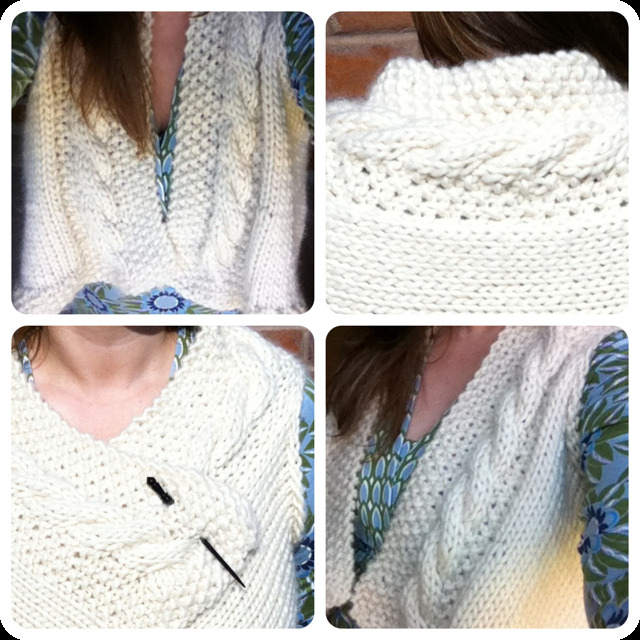 You can download the pattern at Veera Valimaki's Ravelry pattern page. The pattern is also available from Nimu Yarns who are offering KAL participants buying the pattern and suitable yarn from them a 15% DISCOUNT on that purchase. This offer runs until the end of May 2012. Either Isel or Ullscarf will give you sufficient meterage to complete the pattern. Use the code STRIPEKAL to activate the discount on your order of these products. Edit: this has now been extended to include Langstrath, Mickleden & the Different Lines pattern. Just some stitch markers (or scrap yarn to use as stitch markers). I'm in, what are the rules? That's easy, there aren't really any rules - just knit along with us, tell us about your progress. You can do this on your own blog, by commenting on one of our blogs (we're posting our updates on Tuesdays), on twitter using #SSSKnitalong and you can also post to Instagram using the same tag. I've already cast on and posted a few sneaky pics. Feel free to use the images we've provided. If you're in the the Southern hemisphere, you may prefer these which don't include "Spring 2012"! I think that's most of the questions covered. If you have any more, please leave a comment. I totally love the wrap! Utterly gorgeous and the yarn looks really smooshy. Good luck with the Knit a Long it looks like fun. I think the wrap is wonderful. I love chunky light-coloured work, beautiful. How long will the knit-along take place for? I have assigned so many WIPs for myself right now, that I don't know if I could take on another, would love to, but need to see if I can plan it in!! I love your finished wrap, all creamy white! Beautiful! I think white is also a great color in winter when it snows. I won't join the knit along, too many projects on the needles right now. Your wrap is really lovely. Your KAL looks wonderful, if I had time I would definitely join in. I've got too many things I need to make before I can take on new things. I hope you'll do another one some day though. Oooh, well done on your FO, it looks brilliant. A black one would indeed be great for next winter. The wrap is stunning! I love it in the white. The KAL looks fun :). What a terrific wrap! It's timeless in white. I wish I could knit and join in the KAL! That's such a good pattern. :) I can't wait to see everyone's in blogland. And I love the wrap, the texture looks so cloud-perfect. That shawl is fabulous!! I went to Unravel courtesy of Crafts from the Cwtch and Nimu and would loved to have bought some yarn from Ruth and Belinda but didn't see the point! I am now knitting and have finished my first hat tonight (didn't use a pattern) so can't wait to go back to Unravel next year to see them!!! Nice little wrap; looks like it'd fill up an open collar nicely. Good luck with the KAL. It's always fun to see the pattern worked up in a variety of colours!